The Twelfth Corps marches from Leesburg, using Edwards Ferry Road, to cross on the upper bridge. The Artillery Reserve begins crossing on the lower bridge. After crossing, Twelfth Corps proceeds along the C&O Canal Towpath. 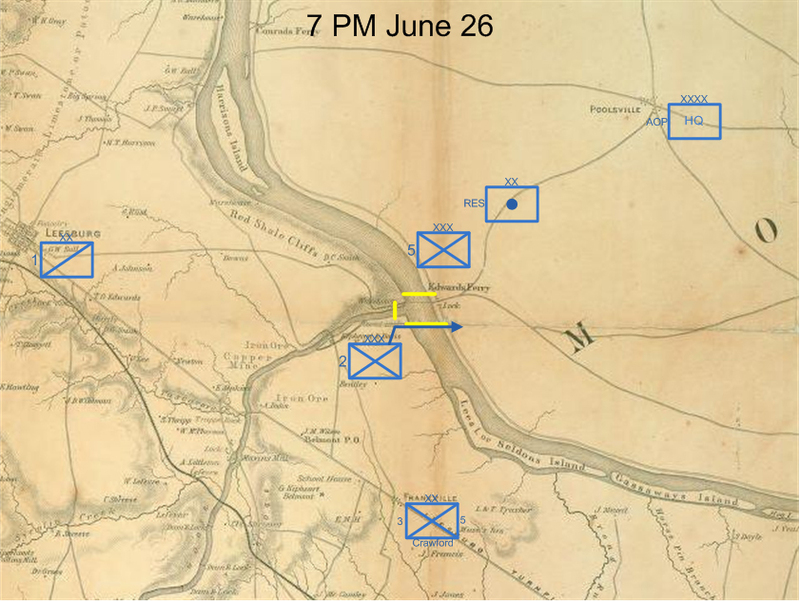 The Artillery Reserve continues to cross, and will proceed toward Poolesville, Maryland. The Army HQ arrives from Fairfax and also proceeds to Poolesville. 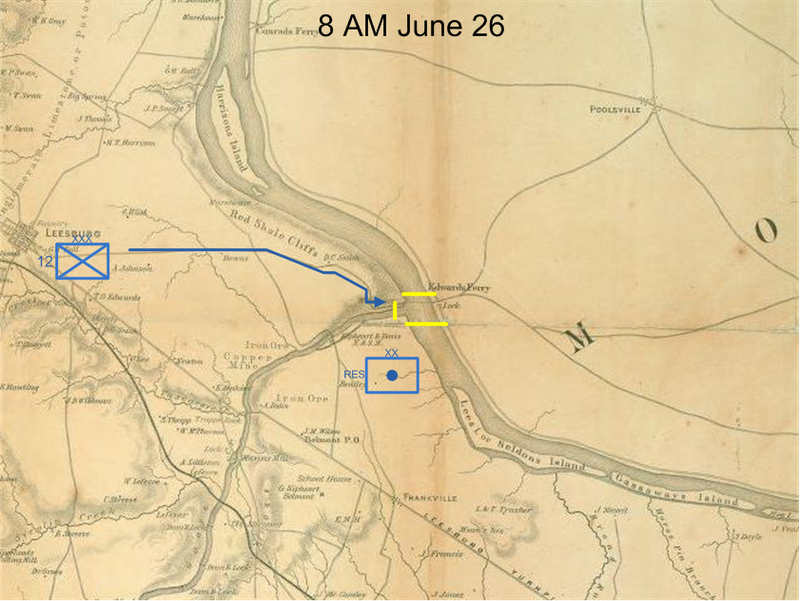 The Fifth Corps now occupies Leesburg after a morning march from Aldie, Virginia. The Second Corps arrives from Gum Springs (modern day Arcola), Virginia, but waits for traffic to clear. Army Headquarters now located at Poolesville, the road behind to the crossing site is jammed with wagons of the various elements already across, and the guns of the Artillery Reserve. Second Corps crosses on the lower bridge, continuing well into the night. Fifth Corps crosses on the upper bridge and uses the towpath. 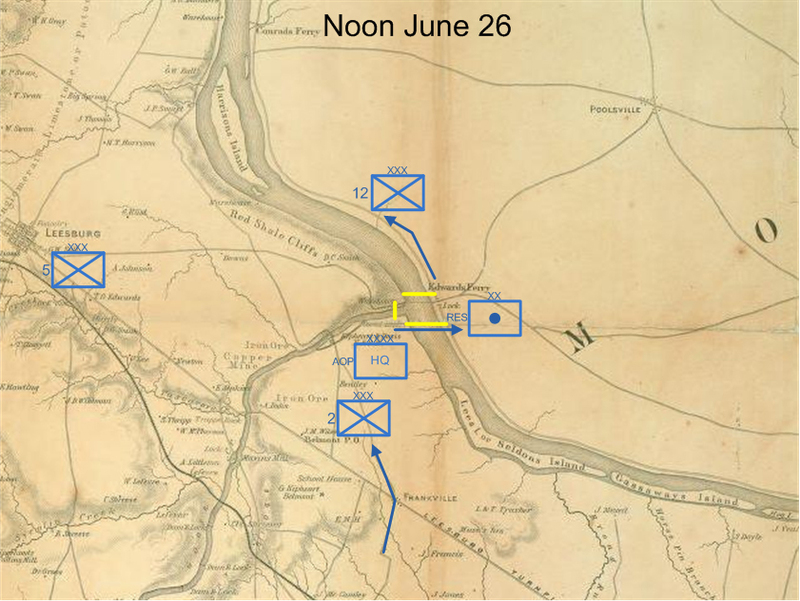 Buford’s Cavalry Division replaces Fifth Corps in Leesburg, covering the crossing from the west. Crawford’s Division of Pennsylvania Reserves, to be attached to Fifth Corps, arrives after a long march on the Leesburg Pike. Traffic on the road to Poolesville remains heavy, but the Second Corps marches away from the crossing site. Crawford’s Division bivouacs for the night at the mouth of Goose Creek. 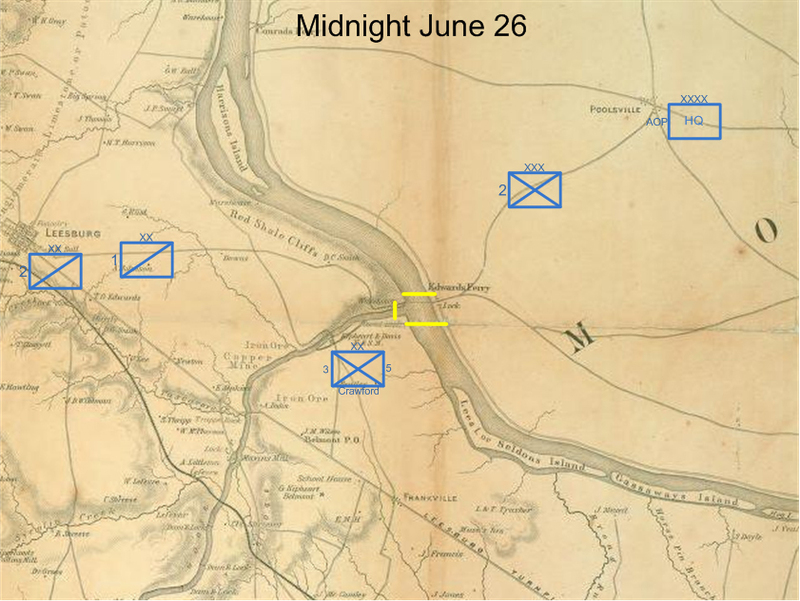 Buford’s and Gregg’s Cavalry Divisions spend the night in the vicinity of Leesburg.